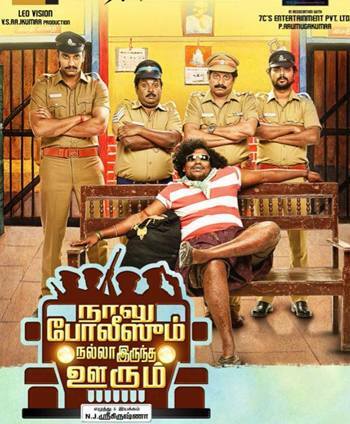 Tamil film Naalu Policeum Nalla Irundha Oorum is a tedious watch, says S Saraswathi. Debutant director N J Srikrishna’s Naalu Policeum Nalla Irundha Oorum revolves around the saying, 'All our actions have consequences'. It tells the story of four policemen, whose selfish and thoughtless actions destroy the peace and goodwill of an entire village. The director has attempted to portray a serious subject with comedy, but this unfortunately undermines the message behind the story. You never really connect to the characters, who seem rather fake and silly. The film is produced by V S Rajkumar under the banner Leo Visions. They are known for their hit films like Naduvula Konjam Pakkatha Kaanom and Idharkkuthane Aasaipattaai Balakumara. The film opens in a small village called Porpandhal that has been receiving the President's medal for Model Village for five consecutive years. The people of this village are friendly, no one locks their doors, there is no fear of theft and a gold chain can lie on the street for two whole days, until the rightful owner claims it. The village has four policemen, Shanmughapandian (Arulnithi), Chelladurai (Bagavathi Perumal), Ilaiyaperumal (Rajkumar) and a constable played by actor Singampuli. Having nothing to do in this perfect village, they spend their time watching cricket matches and playing cards and carrom. Since no case has been filed for over 25 years, the government decides to close down the station and transfer the officers to another village, which is known for its frequent riots and its trouble-making residents. The four are now in a fix. They do not want to leave this quiet village life. They plan to instigate some petty crime, so the government will be forced to reverse its decision. But one thing leads to another and soon everyone is at each other's throat. There is complete chaos -- looting and killing become rampant. The four come to regret their action, but is it too late already? Can they win this year's Model Village title? Neither the comedy in the first half, nor the excessive melodrama in the second make much of an impression. The actors seem to have no clue as to what they are doing. Bagavathi Perumal and Rajkumar have the same weird expression they had in Naduvula Konjam Pakkatha Kaanom. Sadly it does not work in this film. Arulnithi and Remya Nambeesan, who plays his love interest in the film, are equally boring. Singampuli does try to pep things up a bit, but even he gets tedious after a while. Music by debutant B R Rejin is average and so is the cinematography by Mahesh Muthuswami. Even at two hours 15 minutes, the film seems incredibly long and barely manages to hold your attention. The highly exaggerated screenplay, poor execution and clumsy performances make debutant director N J Srikrishna’s Naalu Policeum Nalla Irundha Oorum a total waste of time.